Experience the drama and excitement of the Isle of Man TT with the action-packed, 2-disc Official Review of the greatest road race festival in the world. This is every vital moment from all nine races as the TT entered its second century, with aerial footage, on-board cameras, kerbcams, interviews, on-screen graphics and more, delivering the ultimate look back at some of the best racing the TT has ever seen. 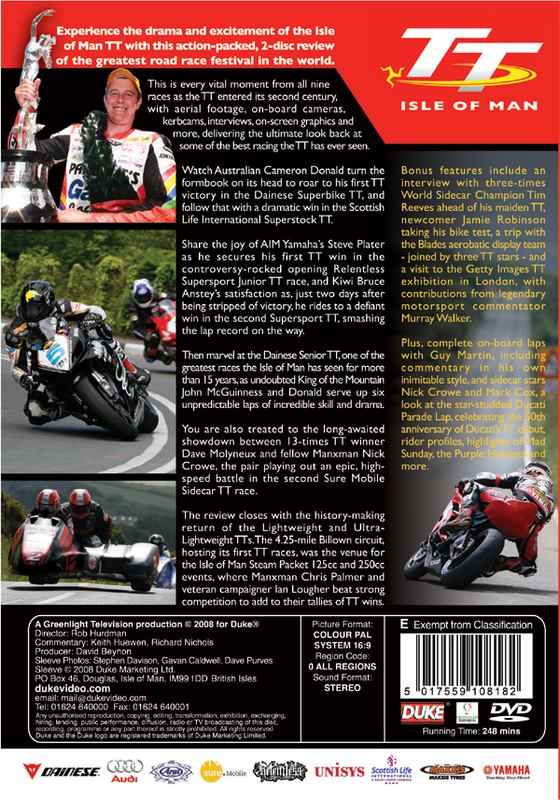 Watch Australian Cameron Donald turn the formbook on its head to roar to his first TT victory in the Dainese Superbike TT, and follow that with a dramatic win in the Scottish Life International Superstock TT. Share the joy of AIM Yamaha's Steve Plater as he secures his first TT win in the controversy-rocked opening Relentless Supersport Junior TT race, and Kiwi Bruce Anstey's satisfaction as, just two days after being stripped of victory, he rides to a defiant win in the second Supersport TT, smashing the lap record on the way. Then marvel at the Dainese Senior TT, one of the greatest races the Isle of Man has seen for more than 15 years, as undoubted King of the Mountain John McGuinness and Donald serve up six unpredictable laps of incredible skill and drama. You are also treated to the long-awaited showdown between 13-times TT winner Dave Molyneux and fellow Manxman Nick Crowe, the pair playing out an epic, high-speed battle in the second Sure Mobile Sidecar TT race. The review closes with the history-making return of the Lightweight and Ultra-Lightweight TTs. The 4.25-mile Billown circuit, hosting its first TT races, was the venue for the Isle of Man Steam Packet 125cc and 250cc events, where Manxman Chris Palmer and veteran campaigner Ian Lougher beat strong competition to add to their tallies of TT wins. Bonus features include an interview with three-times World Sidecar Champion Tim Reeves ahead of his maiden TT, newcomer Jamie Robinson taking his bike test, a trip with the Blades aerobatic display team - joined by three TT stars - and a visit to the Getty Images TT exhibition in London, with contributions from legendary motorsport commentator Murray Walker. Plus, complete on-board laps with Guy Martin, including commentary in his own inimitable style, and sidecar stars Nick Crowe and Mark Cox, a look at the star-studded Ducati Parade Lap, celebrating the 50th anniversary of Ducati's TT debut, rider profiles, highlights of Mad Sunday, the Purple Helmets and more.